There is a wide range of paid temporary roles available throughout a federal election from supervisory to administrative roles. These positions support preparation for the election and conducting early voting. Early voting includes pre-poll voting in several locations across each electorate and mobile polling, which provides a range of voter services to remote communities, hospitals, aged care and other facilities. Some positions may involve long hours or travel, predominantly Monday – Friday. These positions conduct polling at polling places on election day. You will normally be required to work extended hours, usually from 7am to 10.30pm. The polling place will be open from 8am to 6pm and staff will conduct a count of ballot papers once polling ends. Staff must remain at the polling place until all duties are completed. There are also a number of positions required on election night, usually commencing from 4pm onwards. This includes assisting with counting votes, processing materials returned from polling places and overnight sorting of materials. These positions are located at the divisional "out posted centre". The majority of these roles involve prolonged periods of sitting and standing, and the ability to lift and carry up to 12kgs. These positions support the count of all votes cast at the election and administrative work to finalise the election. This may involve extended hours and weekend work and typically runs for three weeks after election day. Each position has its own set of tasks, competencies and attributes as outlined below. All election staff are required to complete relevant training before commencing employment. This may be a combination of on the day, online and attendance training. Ability to work long hours in varying polling place conditions, with prolonged periods of standing, sitting or driving (for mobile polling roles). 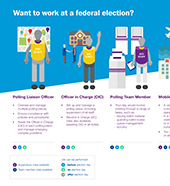 The election staff roles infographic provides a quick overview of type of roles available before, on or after election day. Working at federal elections helped me practice and improve my organisational and leadership skills. 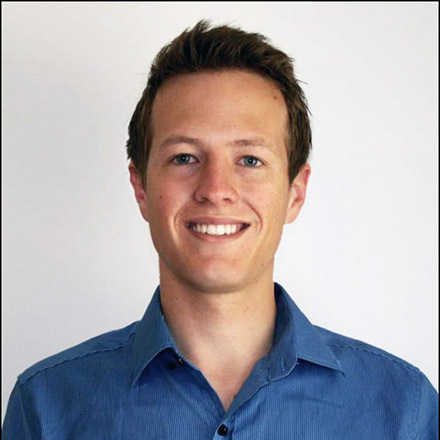 Jason Tate, Primary School Teacher, WA.